I moved to the Bay Area from Milwaukee about five months ago. 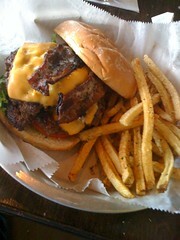 Among the things I miss from my hometown are my two favorite burger restaurants–AJ Bombers and Sobelman's. Both have used Word of Mouth (WOM) to become successful small businesses, but while one built its buzz over 10 years, the other used social media to become a success in just one year. The stories of these two businesses can provide insight and inspiration to much larger brands seeking to create benefits with social media. Sobelman's is a little hard to find–it's located in an industrial part of the city rather than in a fashionable neighborhood–but that didn't prevent it from building a broad-based following since opening in 1999. While dining at Sobelman's, you're equally likely to find guys with hard hats, students in Marquette colors and professionals in suits or khakis. Sobelman's created its success the old-fashioned way–with a great story (Dave and Melanie Sobelman worked the grill and took orders), a delicious product and a smart mix of traditional marketing, such as sponsoring Marquette University events. The road to success for AJ Bombers was considerably shorter, although there were plenty of reasons to think the business would fail quickly: It was launched in the middle of the worst recession in generations and was located at an address that had seen at least five businesses fail in recent years. AJ Bombers' one-year path from grand opening to the pages of the Wall Street Journal speaks volumes about the way social media is changing business. Active engagement on Twitter and Facebook. On Twitter, AJ Bombers has tweeted more than 10,000 times to its 3,000 followers. On Facebook, the restaurant updates its status several times a month and engages with 1,000 fans. Offering new FourSquare mayors a free burger and fries, encouraging repeat visits and checkins among its fan base. A promotion launched with a YouTube video, creating a contest that permitted one lucky winner to earn free burgers for a year. Regular tweetups to draw fans to different events, such as a holiday party and Bloody (Mary) Brunch. Turning a stolen sandwich board into a local news items thanks to a reward offer and smart use of Twitter. A new campaign (in partnership with Sobelman's) to attempt to bring the Travel Channel's "Food Wars" to Milwaukee for a showdown between the two competing burger bars. Even with little monetary outlay, success can breed problems. I spoke with Joe Sorge, owner of AJ Bombers, and he noted that "in some ways we backed ourselves into a corner–guests expect immediate responses in social media" but he added, "I don't mind the corner!" Sorge still enjoys personally monitoring Facebook and Twitter every day as often as possible, but he is beginning to delegate some of the responsibility. Sorge is training others to monitor and respond to fans on Twitter (with individuals' initials at the end of tweets to make it clear the human behind the tweets). Another thing AJ Bombers hasn't done is turned their Twitter and Facebook stream into a string of direct marketing offers. Unlike some brands that use their Twitter and Facebook profiles as a replacement for FSIs and direct email marketing, Sorge instead points to inspiration from Seth Godin to pursue "the opposite of interruption-style marketing." Sorge isn't interested in one-way communication but instead praises the value he receives from input and feedback. "Customers are becoming the business," he says. "We had no idea that the 'Burger of the Month' would be so popular and that we'd have to change it the 'Burger of the Moment.'" In fact, one of their most popular burgers was created by a customer, @KateBarrie; the Barrie Burger features peanut butter, bacon and cheese. The final thing AJ Bombers isn't doing is waiting for someone else to prove ROI before experimenting with different social media programs. Sorge is unafraid to try new things in inexpensive and small ways. The owner of AJ Bombers knows his customers, understands his brand and recognizes that social media is a way to connect the two. Really, how hard is that?